Suwanee, Ga. (May 1, 2012) – Rugged Ridge, a leading manufacturer of high-quality Jeep® accessories, today announced the availability of Half Doors for 2007-2012 Jeep® Wrangler JK two and four-door models. Rugged Ridge Half Doors enable Jeep® owners to add a new level of enjoyment to their vehicle by providing an open-air driving experience unachievable with the standard full-size doors. Off-road enthusiasts benefit even further, with added visibility, making spotting obstacles on the trail a much easier task. Additionally, Half Doors can be paired with optional Rugged Ridge Upper Soft Doors to fully protect your Jeep® from the elements. 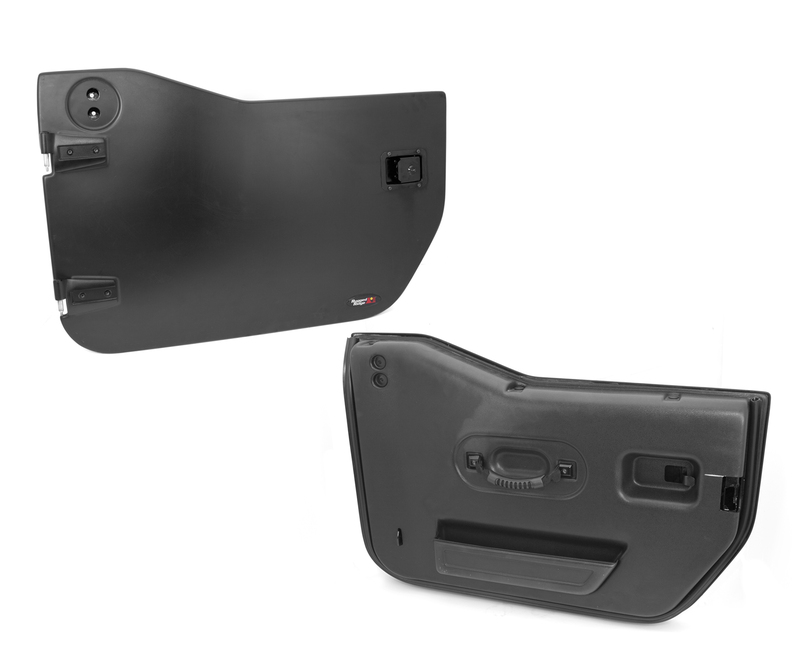 Rugged Ridge Half Doors are engineered to be a direct bolt-on replacement for all 2007-2012 Jeep® Wranglers and are compatible with both factory and Rugged Ridge’s replacement mirrors. Constructed from high quality UV-resistant, impact-resistant ABS thermoplastic over a reinforced internal steel frame, Rugged Ridge’s new doors are lightweight, yet durable enough to withstand the harshest conditions of off-roading. The doors are manufactured in a striking matte black finish, but can be painted to one’s preference. Available in pairs of either front or rear doors, each kit includes two Half Doors, factory-style hinges, lockable handles, door straps, interior grab handles, interior storage pockets, mounting hardware and a step-by-step installation guide. 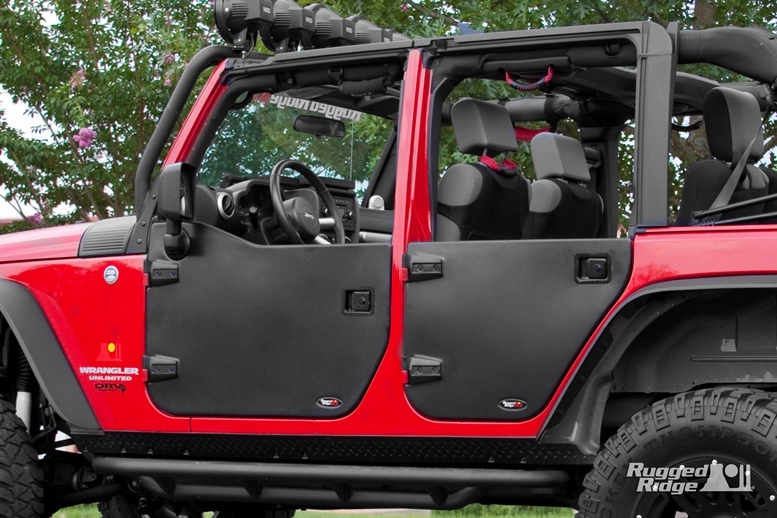 Like all Rugged Ridge products, the Half Doors carry the peace of mind of an industry-leading three-year warranty. Rugged Ridge Half Doors are available online and through select Jeep® parts & accessories and off-road retailers nationwide for $799.99/pair. For more information on the Jeep® Half Doors, Rugged Ridge’s complete line of high-quality Jeep® and off-road products or to find an approved retailer, please contact Rugged Ridge at (770)-614-6101 or visit http://www.ruggedridgeoffroad.com. For nearly two decades, Rugged Ridge has designed, tested and manufactured the highest quality parts and accessories for Jeep® vehicles. As a division of OMIX-Ada, the leader in replacement parts for Jeep® vehicles, Rugged Ridge has been helping enthusiasts build the 4×4 of their dreams with a well-established pedigree in the off-road market. Omix-Ada is the world’s largest independent manufacturer and wholesaler of Jeep® parts and accessories. Headquartered in Suwanee, Ga., Omix-Ada’s products are distributed throughout the USA and in more than 50 countries worldwide. As the parent company of Rugged Ridge®, ORV by Rugged Ridge®, Alloy USA®, Outland® and Precision Gear®, Omix-Ada® Inc manufactures more than 16,000 Jeep® off-road, restoration and replacement parts and accessories. For more information, please call Omix-ADA at 770-614-6101 or visit www.omix-ada.com.